Estimated Biomass Density on the three Twin Lakes. 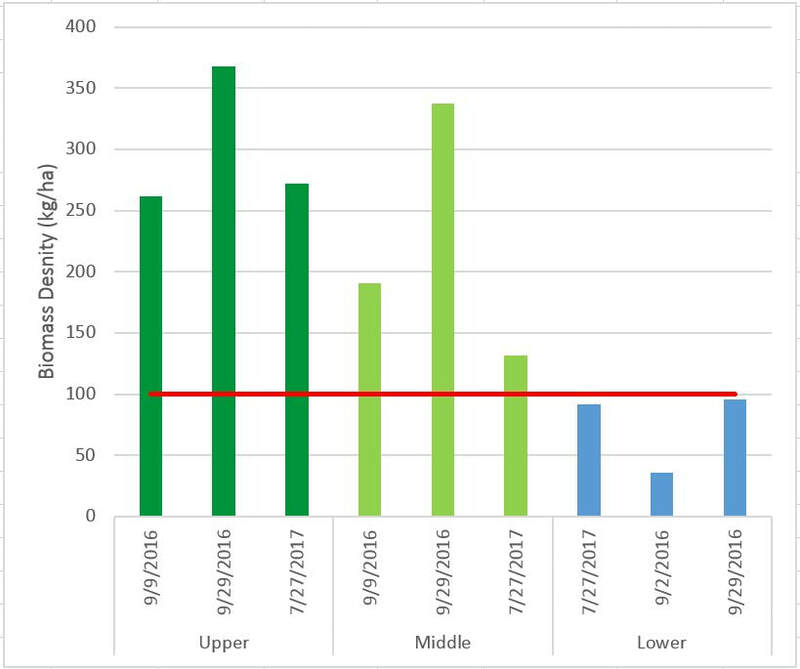 The red line indicates the threshold above which carp will likely have a negative impact on water quality. The first step in managing carp populations is understanding the size of the population, where they congregate, and how and where they move around. Fish biologists use a technique called Mark and Recapture to estimate population size and biomass. Electrofishing gear is used to temporarily stun fish to the surface, where the carp are collected, measured, and weighed. A mathematical formula is used to translate this mark and recapture data into an estimate of the carp population. Mark and Recapture surveys were completed twice in September 2016 and once in July 2017. Forty carp were tagged with small radio transmitters implanted under their skin in Fall 2016. Commission staff periodically either boated or in the winter walked the lakes with portable tracking antennas to track where the fish go and where they overwinter and spawn. Carp are strong and wily swimmers and are known to swim miles through storm sewers and small channels. 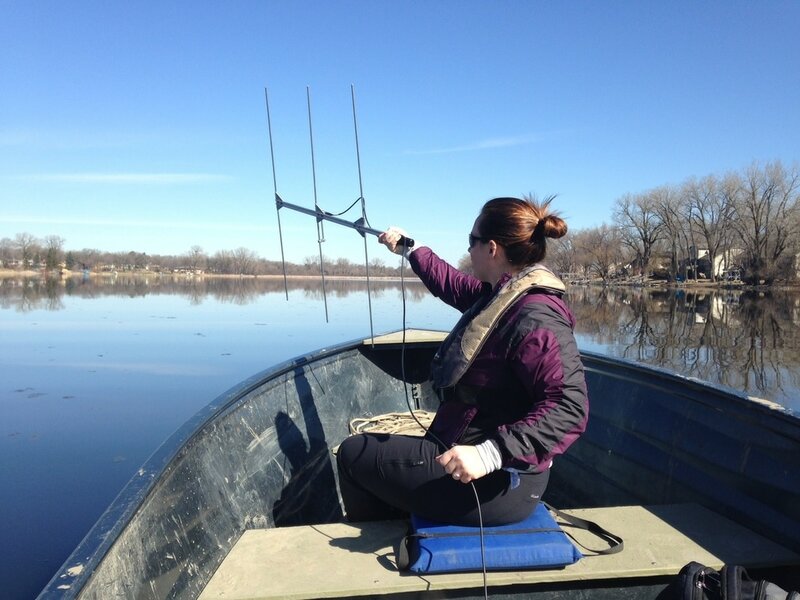 To investigate whether fish are migrating between Twin/Ryan Lakes and Shingle Creek, a stationary antenna was placed on Ryan Creek between Lower Twin Lake and Ryan Lake. That stationary antenna logged every time a tagged carp swam past. Tracking carp on Twin Lake. As expected carp were located in large dense schools in deeper water habitats in the dead of winter (January). 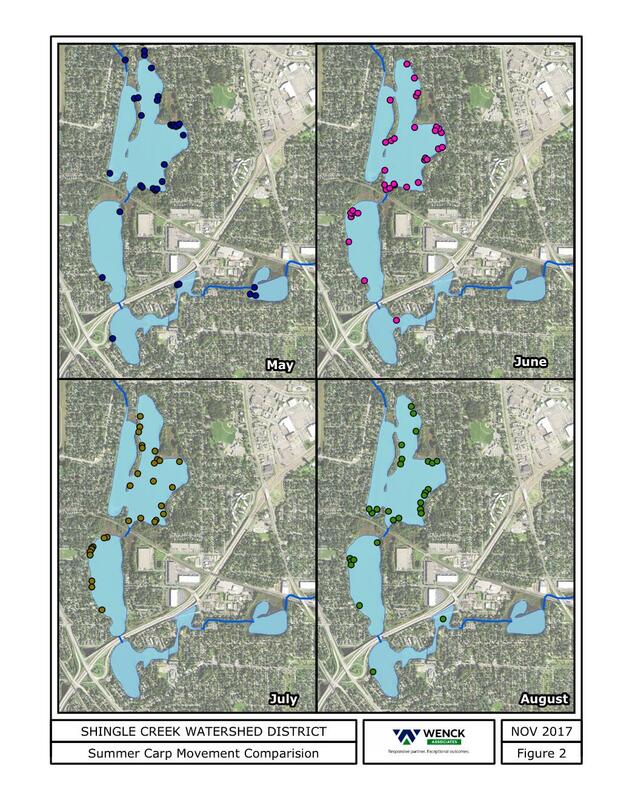 As conditions began to warm and watershed runoff began to move water under the ice (February), the carp were located in moderate depth areas in the lakes and/or areas where storm water inputs were likely bringing in warmer, oxygenated waters. 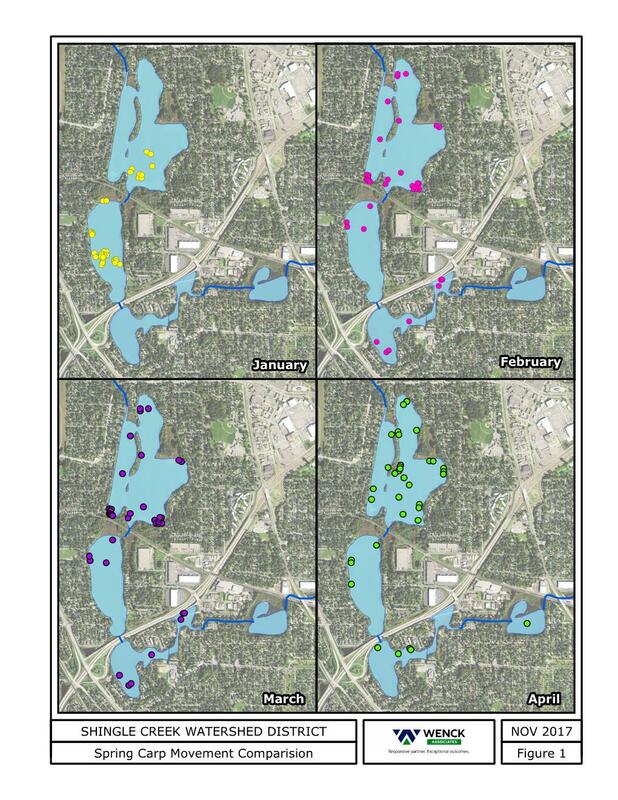 The March and April sampling efforts were a week apart and showed large changes in the locations of carp. In general, the carp appeared to be schooling in shallow waters and were likely preparing for spring spawning. Successful recruitment and spawning likely occurs in shallow wetland habitats and/or storm water ponds. Marked carp have been found in Ryan Lake, probably swept over the France Avenue weir during high flow events. Marked carp are also being found in upstream wetlands, which may be spawning habitat. Tracking efforts occurred more frequently during suspected spring spawning migrations, then changed to monthly during the summer and fall. Tracking will be repeated in December 2017-January 2018 to confirm fish schooling locations as ice conditions permit. This project is funded by an EPA Section 319 grant administered by the Minnesota Pollution Control Agency and by the Shingle Creek Watershed Management Commission.